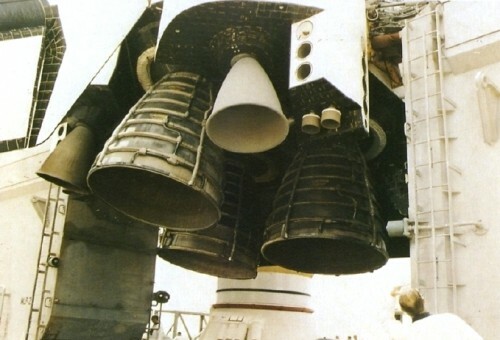 Close-up view of Discovery’s three main engines—still exhibiting evidence of scorching from their momentary ignition on 26 June 1984—in the wake of the shuttle program’s first RSLS abort. (Credits: NASA). Throughout its 30-year career— consciously or unconsciously— the space shuttle was acknowledged to be one of the most dangerous piloted space vehicles ever brought to operational status. Although its first four teams of astronauts had ejection seats, their usefulness and survivability were questioned from the outset, and from STS-5 and the increase in crew size their inclusion became so impractical that they were done away with. Little escape capability of substance was available until after the separation of the Solid Rocket Boosters (SRBs), two minutes into flight, and NASA engineers worried constantly about the dangers of a failure of the shuttle’s three main engines. On five occasions, between June 1984 and August 1994, a handful of shuttle crews heard over the intercom a four-letter acronym that shook them to the very core: RSLS, denoting a Redundant Set Launch Sequence, indicative of a harrowing engine shutdown on the pad, right before launch. 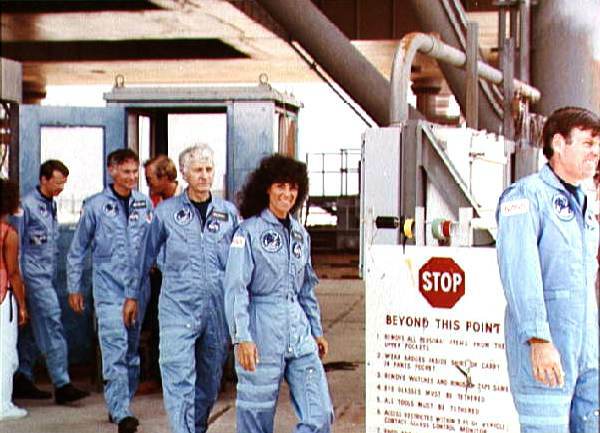 Clad in their blue flight suits, the STS-41D crew included America’s second female astronaut, Judy Resnik (Credits: NASA). The “white room” and crew access arm, aligned with Discovery’s middeck ingress/egress hatch, are clearly visible in this image. Had a “Mode One Egress” been called, the 41D astronauts would have been required to run to the slidewire escape baskets … and risk immersion in invisible hydrogen flames (Credits: NASA). Instantly, Coats, whose responsibility as pilot was to monitor the engines during ascent, jabbed his finger repeatedly onto the button to shut it down. The status indicator did not change; it remained dark. 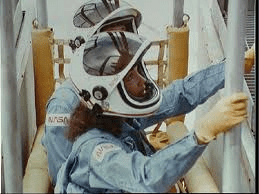 Downstairs, Walker’s eyes were focused intently on the procedures for “Mode One Egress,” the instructions for opening the side hatch and evacuating the vehicle. Several miles away, on the roof of the Launch Control Center, the astronauts’ families were watching the unfolding drama … and theywere perplexed. “A thick summer haze had obscured the launch pad,” wrote Mullane. “When the engines had ignited, a bright flash had momentarily penetrated that haze, strongly suggesting an explosion. As that fear had been rising in the minds of the families, the engine-start sound had finally hit … a brief roar.” The sound echoed off the walls of the Vehicle Assembly Building (VAB) and was gone. Within seconds, it became clear what had happened. STS-41D astronaut Judy Resnik rehearses procedures for operating the slidewire baskets on Pad 39A. Such procedures would be followed in the event of an evacuation from the orbiter (Credits: NASA). 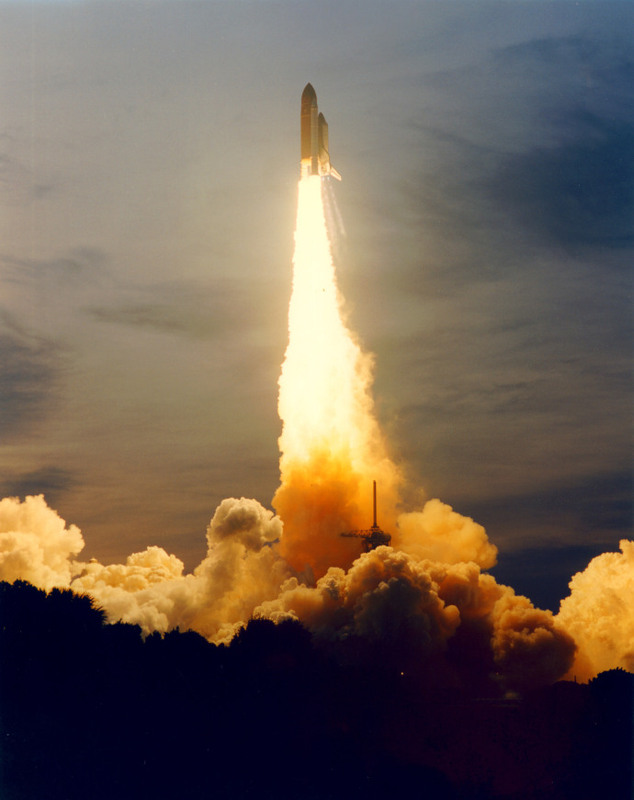 Challenger roars, with seeming perfection, toward orbit on 29 July 1985. 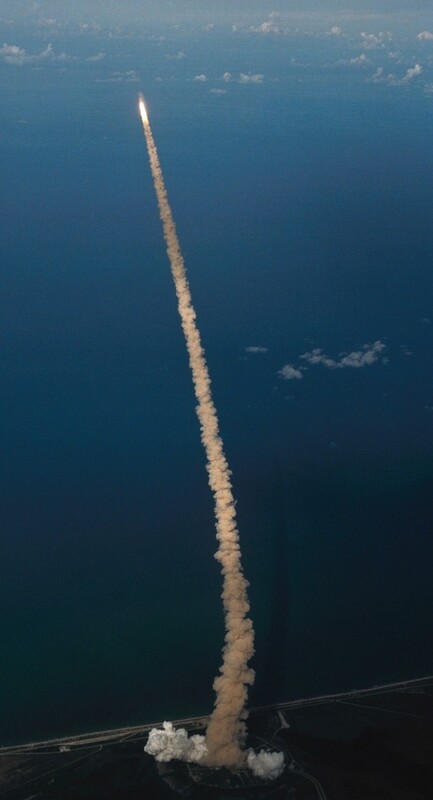 Less than five minutes into the ascent, her crew would brush disaster by a mere whisker (Credits: NASA). Challenger’s three main engines splutter and die in the shuttle program’s second RSLS pad abort on 12 July 1985. Her actual launch, 17 days later, although it successfully delivered the STS-51F crew into orbit, would be equally harrowing (Credits: NASA). In the pre-dawn gloom of 18 August 1994, Space Shuttle Endeavour sat on her seaside launch pad at the Kennedy Space Center, Fla., bathed in million-candlepower xenon floodlights, as the final seconds of the countdown to her voyage into orbit evaporated. Although STS-68 would be her seventh flight, it was in many ways a repeat of her sixth, for the orbiter carried the massive Space Radar Laboratory for observations of the Home Planet. Barely four months earlier, on STS-59, Endeavour had flown SRL-1, and on STS-68 she would monitor changes between late spring and late summer. For astronaut Tom Jones, who flew both, the second flight offered him the chance to seize a new record for the shortest span—just 120 days—between a pair of missions. Alas, for Jones, today would bring him cruel fortune … and for his crewmate, Dan Bursch, it would be crueler still. The closest the shuttle ever came to a launch at the time of abort was T-1.9 seconds, on 18 August 1994. 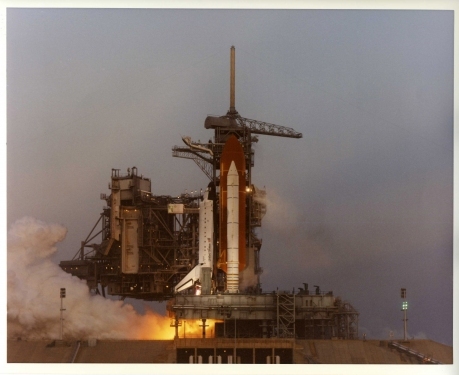 So close was the shuttle to launch, the on-board General Purpose Computers had already moded to their 102 ascent software configuration at the time of the abort (Credits: NASA). Endeavour was primed and ready to go—or so it seemed. The STS-68 crew departs the Operations and Checkout Building, bound for the launch pad (Credits: Spacefacts/Joachim Becker). Computers. It was they, and they alone, which would monitor hundreds of separate sensors and execute decisions as to whether the mission would fly today. The disembodied voice of the launch announcer echoed from loudspeakers, crisply acknowledging the seconds as they worked their way backwards toward the ignition of the three main engines, the ignition of the twin Solid Rocket Boosters (SRBs), and a date with a high-inclination orbit to radar-map the Home Planet for the next 10 days or so. At 10 seconds, the darkness was punctuated by the bright cascade of sparks from the swirling hydrogen burn igniters, as they fired off to disperse unburnt gas in the vicinity of the main engine nozzles. All seemed normal. Then, with shocking abruptness, something went wrong. As the Ground Launch Sequencer automatically kicked in to “safe” the vehicle, the three blazing engine bells suddenly fell dark and silent. For the third time in less than 18 months (and only the fifth occasion in the shuttle’s operational history), a Redundant Set Launch Sequencer (RSLS) abort had been called, after engine start, producing a hazardous on-the-pad shutdown. However, whereas previous aborts had occurred at around T-3 seconds, STS-68 had gotten down to a mere 1.9 seconds ahead of liftoff. Almost immediately, cooling water was sprayed onto the hot engines and the attention of everyone in the Launch Control Center was riveted upon the Main Propulsion System (MPS) fire detectors; if any of them had tripped, the abort carried the prospects of turning into a bad day, for a invisible hydrogen fire at the base of the main engines could easily spread across the pad and trigger an explosion. And that would demand a “Mode One Egress”: a hairy evacuation of the astronauts from the orbiter to ride slidewire baskets to safety. The gathered spectators at the Cape watched in horror and alarm as the famous countdown clock starkly read T-00:00:00, yet no shuttle ascended into the heavens and only a large smudge of grey cloud rose ominously above Pad 39A. Then came the call which brought a measure of calm to the proceedings: “No MPS fire detectors tripped.” There was no evidence of fire on the pad, meaning a “Mode One Egress” of the vehicle would probably be unneeded. The white room was moved back into position alongside Endeavour’s crew access hatch, to facilitate the departure of Baker and his men. Pilot Terry Wilcutt shut down the three APUs. Through Endeavour’s tiny side hatch window, Tom Jones could clearly see the Pad 39A gantry visibly swaying backwards and forwards; the vehicle was still rocking from the “twang” effect induced by the ignition of her main engines. Following an engine replacement, Endeavour roared into orbit on 30 September 1994 (Credits: NASA). Since the Mission Management Team looked upon an RSLS in the same manner as an actual launch, the abort demanded a complete re-inspection of all main engines in the VAB engine shop and would produce a delay of approximately six weeks. Meanwhile, Dan Bursch, sitting in the flight engineer’s seat behind Commander Mike Baker and Pilot Terry Wilcutt, was even more unlucky, having also sat through the STS-51 pad abort, almost exactly a year earlier. Now, his STS-68 crewmates teased him without mercy and, according to Jones, “he lamented that no one would bother coming to another of his launch attempts.” In fact, Bursch would gain an unenviable reputation as the only astronaut to sit through two RSLS aborts in his career. In the hours and days which followed, the attention of technicians focused upon a problem with the No. 3 main engine’s High Pressure Oxidizer Turbine. One of its sensors detected a dangerously high discharge temperature, which exceeded the rules of the Launch Commit Criteria, and Endeavour’s computers halted the countdown after the Engine Start Command had been issued. For the astronauts, it seemed their best bet of getting off the ground on 30 September was to convince Endeavour that the unlucky Dan Bursch was not aboard. As a result, when the STS-68 crew arrived at the Kennedy Space Center, a couple of days before launch, Bursch ensured that he climbed out of his T-38 jet in an appropriate “Groucho Marx” disguise. Things did not seem to be going well, for all of them, save Jeff Wisoff, had colds. In spite of the jinxed nature of their flight, 30 September turned out to be charmed, and Endeavour rose perfectly at 7:16 a.m. EDT, right on the opening of the 2.5-hour launch window. It was the last RSLS on the pad, with significant upgrades planned for the main engines in the following years … but the brutal truth was that the shuttle could never be operational or routine and would never be truly safe. More than seven years passed before the next RSLS abort, which came at the end of an otherwise uneventful processing flow of Columbia for STS-55, a joint U.S.-German Spacelab science mission. Shortly after arriving at the launch pad in early February 1993, an issue with tip-seal retainers on the main engines’ liquid oxygen turbopumps had come to light, necessitating their replacement, but by the morning of 22 March the astronauts and the vehicle were ready to go. The attempt to launch the mission that day proceeded smoothly, tracking a liftoff at 9:51 a.m. EDT. 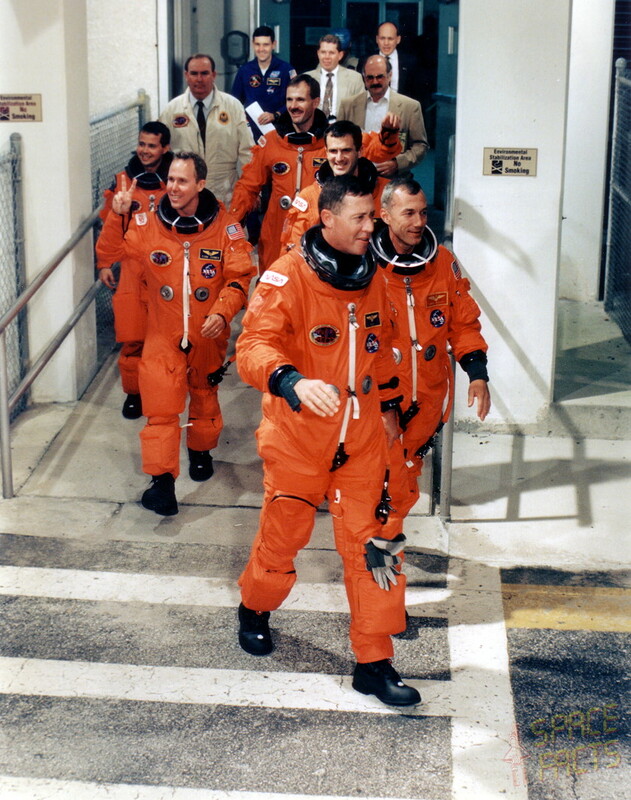 All seven astronauts were suited and transported to the pad, took their seats aboard the orbiter, and marched smartly through their checks. With 31 seconds remaining on the countdown clock, as planned, Columbia’s computers assumed primary control. Columbia’s engines flare to life on 22 March 1993—20 years ago this week—in the third RSLS abort of the shuttle program (Credits: NASA). The situation was equally tense in the Launch Control Center, where ashen-faced Launch Director Bob Sieck watched the proceedings. “Your initial reaction,” he said in the aftermath of the abort, “is to make sure there are no fuel leaks or that there’s nothing that’s broken that’s causing a hazardous situation. Really, it was one of those nice, boring countdowns … until the last few seconds. What did work, and worked very well, were the safety systems on-board. As a result, the crew is safe and the vehicle is on the pad and safe as well.” Nonetheless, the STS-55 crew emerged from the orbiter looking visibly shaken by the incident. It was becoming increasingly likely that a delay of at least several weeks would be needed to remove, replace, and test the engines, and on 30 March NASA announced the next shuttle mission—STS-56, a time-critical flight, scheduled for early April. In the meantime, Columbia’s engines were replaced with a set earmarked for the next mission of Endeavour, and STS-55 finally got its chance to fly on 26 April 1993. The words of the launch commentator at the Kennedy Space Center on the morning of 12 August 1993 were calm and measured, as all eyes focused upon Space Shuttle Discovery as she entered the final portion of the countdown to fly STS-51. The mission—a nine-day flight to deploy a NASA advanced communications satellite and release and retrieve an ultraviolet telescope, atop a Shuttle Pallet Satellite, as well as perform a spacewalk—had already been postponed twice, with the astronauts already aboard the vehicle. On 17 July, a flaw in a pyrotechnic initiator controller, needed to trigger the release of the SRBs from the launch platform, had forced the first scrub. Troubleshooting later identified a thermal instability issue in a solid-state switch card in the ground support equipment, and after replacement and testing the launch was rescheduled for the following week. The second attempt to get Discovery into space on the 24th also proved fruitless, due to an out-of-specification turbine “underspeed” condition in a hydraulic power unit in the right-hand booster. As a result, the countdown was automatically halted at T-19 seconds and the attempt was scrubbed. Due to the July-August Perseid meteor shower, associated with Comet Swift-Tuttle, NASA decided to stand down from making a third launch attempt until the second week in August. It was known that the Perseid debris field would pass closest to Earth on the 11th, and the launch was rescheduled for 9:10 a.m. EDT the following day. By 12 August, Discovery and her five-man crew were ready to go. The astronauts had closed and locked their visors and their eyes were focused intently on their instruments. Despite a two-and-a-half-minute hold in the countdown at T-5 minutes, due to lost synchronization lock between the Mission Control in Houston and the Merritt Island Launch Area, everything proceeded smoothly. With five minutes remaining on the countdown clock, Pilot Bill Readdy reached over and switched on the Auxiliary Power Units. The trio of hydraulic pumps hummed to life, bringing life, muscle, and control to the shuttle’s hydraulics. The shuttle’s on-board computers automatically commanded a final series of checks on the three main engines and the elevons on the wings. Thirty-one seconds before launch, control of the countdown was handed off to Discovery’s General Purpose Computers. 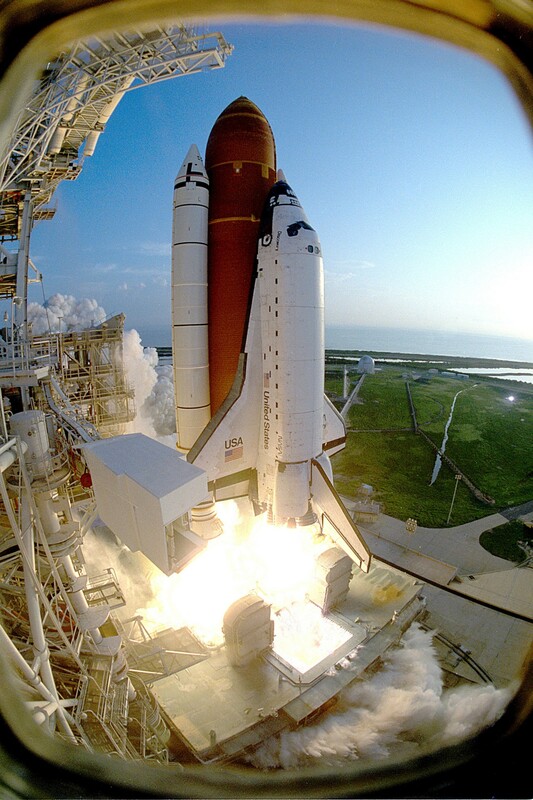 Discovery rockets into space on 12 September 1993, exactly a month after her harrowing pad abort (Credits: NASA). Now, on 12 August 1993, Newman was experiencing the final seconds of a countdown for real. Inside the cabin, the astronauts felt the immense vibration as turbopumps awoke, liquid oxygen and hydrogen flooded into the engines’ combustion chambers, and they roared to life … and then fell silent. Shortly thereafter, the five disappointed astronauts departed Discovery, aware from previous RSLS events that their launch had been called off for several weeks at best. The main engines were replaced and an attempt was provisionally scheduled for 10 September, but this was itself slipped until the 12th. Liftoff was, recalled Jim Newman, “exhilarating,” but the RSLS had given him and his crewmates a grueling rite of passage. 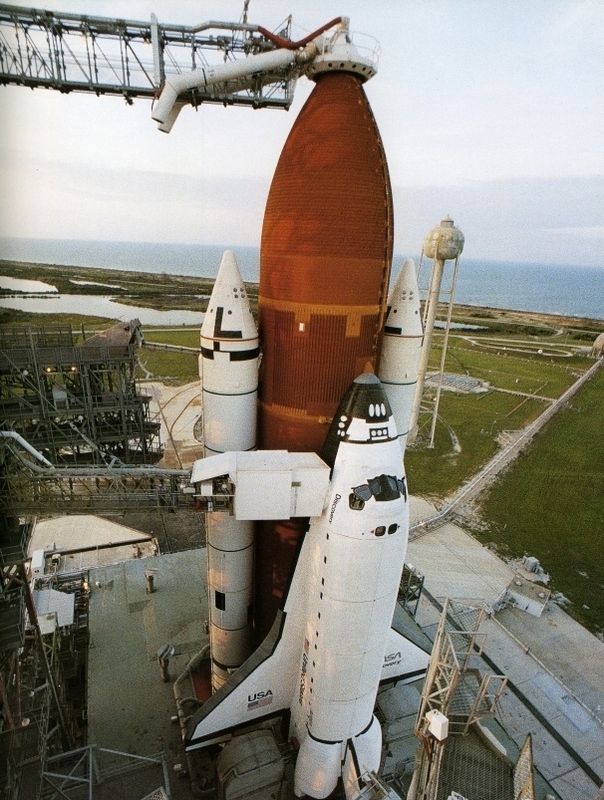 From June 1984 until August 1994, five shuttle crews sat through such aborts on the pad, with Atlantis left as the only orbiter not to suffer one in her career. 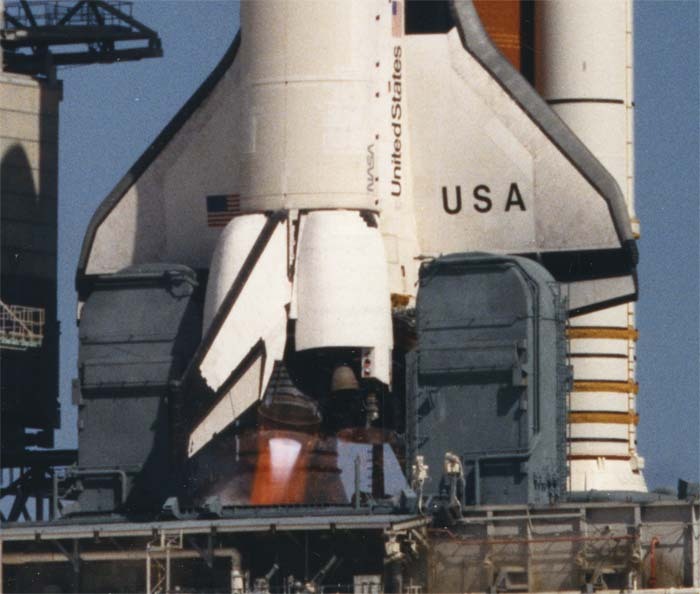 By the middle of the 1990s, upgraded main engines and improved processing and inspection techniques ensured that no other RSLS situations hit the program, although STS-93 in July 1999 came close to a shutdown after liftoff. The shuttle’s fallibility was evident and the dangers of the main engines remained just that—a danger—until the very end of its career.